Gorgeous card! 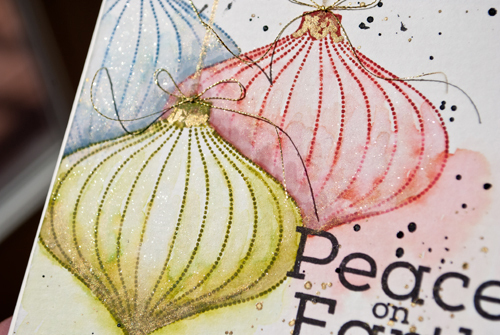 Love the Christmas bulb image, the off the edge card design and all the sparkle. Lovely watercolor effect on the ornaments! And the gold trim too. They look like translucent vintage glass. Thanks so much for joining in with MCV this week! Very pretty! Love your watercolor technique on the ornaments. 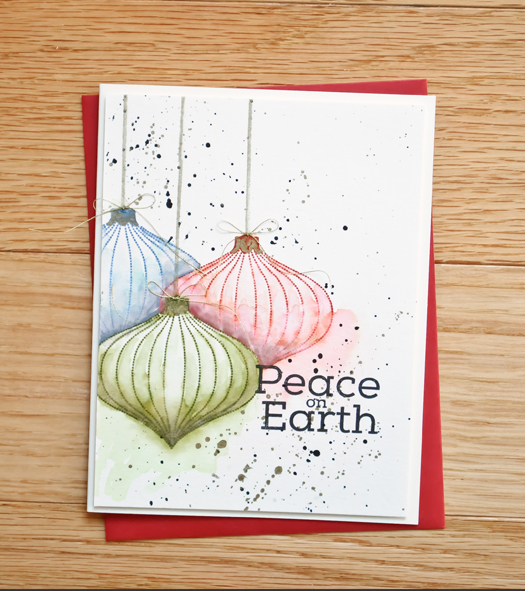 LOVE these watercolored ornaments! So pretty! P.S. I also enjoyed your instructions. Very clever. Love how you layered and colored the ornaments....really lovely! Oh, I like this ornament stamp! Beautifully colored, and the Wink is just perfect! Wow, what a beautiful Christmas card, soft, pretty, elegant, just love it clever you! I also love comment number 17, made me chuckle! Since you have retired your cards have taken on a whole new dimension beyond excellence! This is not a put down of your previous work by any means! I am just really enjoying the feeling of freedom I see in your cards. And being new to retirement myself, I think I see in your work what I feel in my life. And I love all of it! And your written word has always tickled me. You Go Girl! Beautiful card! Fantastic instructions, I do number 17 all the time. I'm not sure which I like better, your card or your commentary. Both are terrific! Thank you for sharing. Love the softness and the layout--great job, Joan! Fabulous - such a great card - love how you colored these gorgeous baubles! These ornaments are absolutely beautiful!!! Wonderful card and congrats on your win! Ooh, I love the softness and sparkle of your watercolouring. So pretty.